Requests for accommodation due to family status are becoming more common as societal norms continue to change. The leading case in Ontario that addresses the worker’s rights and the employer’s obligations on the ground of family status is arguably Devaney v. ZRV Holdings Limited, 2012 HRTO 1590. The case confirms that an employer’s failure to reasonably accommodate an employee’s family caregiving responsibilities may result in a breach of the Human Rights Code (“Code”), and that family status has now been interpreted to include elder care. The applicant, Fancis Lyndon Devaney, worked as an architect with the respondent, ZRV Holding Limited (ZRV) from 1982 until his employment was terminated in 2009. Mr. Devaney alleged that his employment with ZRV was terminated as a result of the respondents unilaterally changing the terms of his contract and not allowing him to maintain a flexible work schedule in order to care for his ailing mother. Shortly following his termination, the applicant filed an Application with the Human Rights Tribunal alleging discrimination on the basis of family status. The respondents submitted that the applicant’s employment was terminated for just cause, due to his persistent failure to regularly attend the office in spite of many warnings. The respondents stated that though the applicant referred to his caregiving responsibilities to his parent, he never sought formal accommodation of his workday, or adjustments of the requirement to accurately account for his attendance or any absences. The respondents denied that the applicant was subjected to discrimination. The applicant, Mr. Devaney, had worked for an architectural firm for approximately 27 years and testified to being the Prinicipal-In-Charge on work dealing with the Trump International Hotel and Tower. Mr. Devaney was also the primary caregiver of his mother whose health had declined in recent years. On January 9, 2009, Mr. Devaney was given a letter terminating his employment. The letter stated that, despite a previous letter to the applicant, and the many warnings the applicant had been given, his attendance record continued to be “abysmal”. 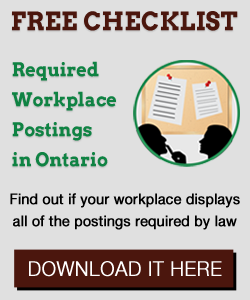 Under Section 5(1) of the Ontario Human Rights Code, the duty to accommodate in the workplace has a two-part obligation, procedural and substantive. In other words, once accommodation is requested by the employee, not only is the employer responsible for investigating the accommodation, the burden then shifts to the employer to demonstrate why the employee’s needs cannot be accommodated. The respondent was ordered to pay Mr. Devaney $15,000 for injury to dignity, feelings and self-respect, to develop and implement a human rights policy and to, amongst other things, provide mandatory human rights training for all partners and staff who perform supervisory and/or human resources functions. Whereas traditionally family status claims were based on women returning from maternity leave, as our society continues to age, employers would do well to prepare for more frequent accommodations dealing with the care giving for elderly parents.